Salting has been used as a way of preserving food since ancient times. Brined eggs are very popular in Chinese culinary traditions. The salt brine is generally flavored with star anise, Sichuan peppercorns and Shaoxing rice wine, but other ingredients, such as ginger, chili peppers and garlic are sometimes used. You will need to find a container that will fit the eggs with a little room to spare. Either a glass jar or a plastic container with a lid can be used. 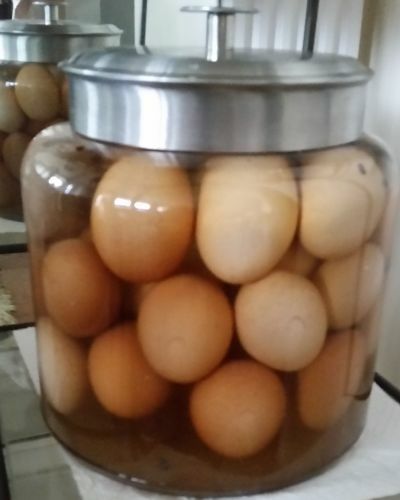 As a general rule, the amount of brine needed will correspond to half the volume of the container and the eggs will occupy the other half. Measure how much water is needed to fill half of the container to calculate the ratio of salt and other ingredients. 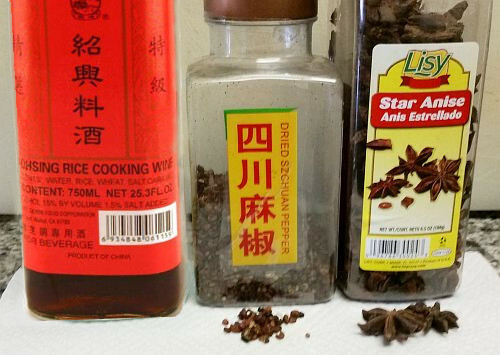 The Sichuan peppercorns and Shaoxing wine (also spelled Shaohsing) can be obtained at most Chinese markets. Shaoxing rice wine is made by fermenting brown glutinous rice to produce an amber colored aromatic liquid with 15% to 18% alcohol similar to dry sherry wine. Rinse the eggs and drain well. Make sure the shells are intact and have no cracks. Set the eggs aside. In a pot, bring the water, salt, anise and peppercorns to a boil. Let the brine cool to room temperature. Once cool, add the Shaoxing wine, and pour the liquid into the brining container. Gently lower the eggs one by one into the brine. The eggs will tend to float in the salty solution. A plastic bag filled with brine or water can be placed on top of the eggs to keep them submerged. The brining process takes from 30 to 40 days. Attach a note with the date to the jar. Store the brining eggs at room temperature in a cool place away from the sun. After 30 days, take one egg and cook it to see if it is salty enough. If not, let the eggs marinate for a few more days. When the eggs are ready, drain them and wipe them dry. Store them in an egg carton in the refrigerator. The salted eggs will keep for several weeks. The eggs are generally served hard-boiled to accompany a meal.